Members of the Madisonville Fire Department (St. Tammany Fire District 2) Local #4969, won the Golden Boot Award for Louisiana IAFF locals, raising $675 per member during the annual Fill the Boot campaign on Labor Day weekend 2015 for a total of raised $15,533. For 62 years the tireless support of our IAFF partners to help kids and adults with muscular dystrophy, ALS and related diseases has given MDA families hope and the opportunity to live longer and grow stronger. 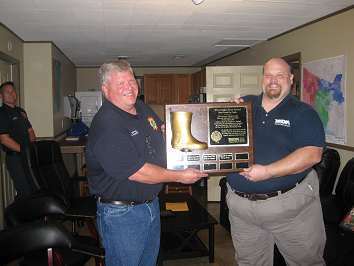 MDA of Southeast Louisiana is pleased to have the opportunity to present the Golden Boot to Local #4969 at the St. Tammany Parish Fire Protection District No. 2 Fire District Board Meeting on Tuesday April 12, 2016. For more than six decades, fire fighters have stood on the front lines to fuel MDA's mission to free individuals - and the families who love them - from the harm of muscular dystrophy and other related life-threatening diseases that take away people's ability to walk, move, smile, talk and even breathe. "For 62 years, fire fighters have fueled MDA's mission to find treatments and cures for muscle-debilitating diseases, and the 2015 Madisonville Fill the Boot results are perfect example of their dedication," said MDA Executive Director Ryan Duncan. "We are extremely grateful to have the support of these truly selfless heroes. It is with their generosity that we will be able to empower MDA families with life-enhancing resources and support that open new possibilities and maximize independence so they can experience the world without any limits." Funds raised through Fill the Boot drives empower families with life-enhancing resources and support, including state-of-the-art support groups and Care Centers, including the MDA Care Centers at Children's Hospital and LSU Health Network in New Orleans. They also help give more than 85 local kids the opportunity to experience the best week of the year where anything is possible at MDA summer camp at no cost to their families at Camp Starlite.